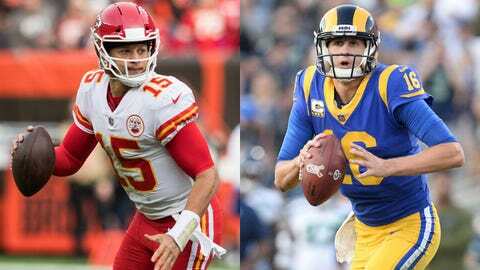 Quarterbacks Patrick Mahomes of the Chiefs and Jared Goff of the Rams lead two of the league's most prolific offenses. LOS ANGELES — Sean McVay has looked up to Andy Reid for years. The Los Angeles Rams‘ young coach constantly studies video of his Kansas City counterpart’s offensive sets during the season, marveling at their intricacies and ingenuity. Instead, the Coliseum will host a meeting of two prolific offenses masterminded by coaches separated by 28 years of age, but shoulder-to-shoulder on the cutting edge of offensive football. Kansas City’s Patrick Mahomes leads the NFL in yards passing; the Rams’ Jared Goff is second. The backfields contain Kansas City’s Kareem Hunt, last season’s NFL rushing champion, and Todd Gurley, the current runaway leader in the category. Offensive fireworks seem inevitable in a matchup tailor-made for prime time, even if the late venue switch caused logistical hurdles for television, fans and the teams themselves. Both teams expressed disappointment about the game being moved out of Mexico City, though McVay said it was “clearly the right thing to do” given the field conditions. This will be the first “Monday Night Football” game at the Coliseum since 1985, and the Rams’ first there since 1979. The late change of venue ruined a big night for thousands of Mexican fans and thrilled Rams fans who will get an eighth home game to cheer, but it had little effect on either team’s preparation. The Rams planned to spend the week in Colorado Springs to prepare for Mexico City’s altitude, and they decided to stay anyway — partly because several players and coaches wouldn’t be able to return to their homes this week because of wildfires surrounding the towns near the Rams’ training complex. The Chiefs merely altered their travel plans to take them west instead of south. “We really haven’t had to change much, other than going to a hotel in Los Angeles,” Reid said. The Chiefs should have WR Sammy Watkins (foot) and LB Anthony Hitchens (ribs) on the field against the Rams. Neither played last week against Arizona, though Hitchens was active in what Reid called “an emergency situation.” Undrafted rookie Ben Niemann got the start in Hitchens’ place and performed reasonably well. Watkins is returning to the Coliseum, where he spent last season as the Rams’ deep threat before getting a huge free-agent deal with the Chiefs. Rams cornerback Marcus Peters spent his first three NFL seasons with Kansas City, making the Pro Bowl twice and establishing himself as an elite defender with 19 interceptions. The Rams haven’t had any evident problems with Peters off the field, either. The Chiefs have been playing without center Mitch Morse (concussion) and right guard Laurent Duvernay-Tardif (broken leg), forcing them to shuffle things around.